The last few months haven’t been a walk in the park for me. It started with a disastrous ride at the Commonwealth Games. 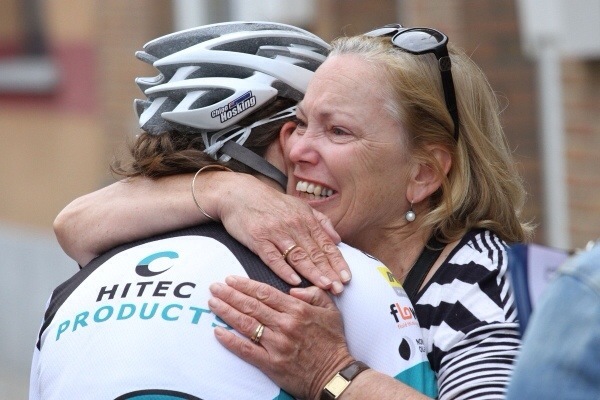 Then the non-renewal of my contract with Hitec Products. Then just when I thought I had found a contract, it was ripped away from me because of my performance at the Games. On top of all this I had a lack of racing which made actually proving to potential teams that I deserved a contract somewhat difficult. I worked on my sprint and then took myself to the hilliest and hardest stage race of the year, the Tour de Ardeche. Four days into the tour, after discussions with my coach I made the decision to finish two days early to make sure I was ready for what could have potentially been my last race ever; the Lotto Belisol Belgium Tour. If ever I needed results it was now and I knew I was more likely to get them in Belgium than on the mountains of France. As it turns out I made the right decision. I won yesterday’s third stage of the Lotto Belisol Belgium Tour and I don’t think I’ve ever fought harder in a sprint. As the sprint kicked up on a 4 per cent incline and I was drag racing the Rabobank train for the stage win all I could think was how much I needed this victory. I guess my ‘fight or flight’ instincts are heavily tilted to the fight side of the scales. As I crossed the line, in typical Chloe style, I clenched my fists and let out a huge scream. I probably scared a few small children and dogs. It was a scream of relief, excitement, disbelief. The first thing I said to my swanny as I rolled up to him gasping for air was, ‘I really needed that’. While the past few months have seemed like a nightmare, yesterday’s stage was like a dream. It was like one of those races that come out of a cycling for dummies text book,’How to win a bike race’. If you haven’t heard about this book, I’ve been told it’s being released next year and is co-authored by Marianne Vos and Marcel Kittel. I pre-ordered mine on Amazon the other day. What? I didn’t realise the race was televised? As it turns out rain had ruined Dad’s fishing trip and he’d decided to jump on a plane to Belgium to join my Mum who was already following the race. The second sign was when my roommate Julie Leth randomly declared to me that I was going to win as we were relaxing in out hotel room before we went to the start. 9 laps of an 11 kilometre circuit the race was fast, and extremely technical. With two short, sharp power climbs spread around the course, an extremely technical last 3 kilometres, and typical Belgium roads (read bad) it was a circuit where if you weren’t at the front you were working twice as hard at the back. Lining up with my Hitec Products team we had a pretty open race plan. In the first road stage on Friday two Rabobank riders – race leader Annemiek van Vleuten and Anna van der Breggen – escaped alone and we had done the majority of the work to close the gap which had exploded out to over 2 minutes at some points. While we did save the race, we paid for it when we had no energy left to produce a result in the final. Our instructions from our director were clear; we don’t chase, if there is a break of five or more there is a Hitec in there, but we don’t chase. For the first lap I hung around in the middle of the peloton, surfing wheels and staying out of trouble. I wanted to get a feel of the course which was a little bit different to the circuit I had raced on in 2012. The biggest shock came from the 3 kilometre to go mark to the 1.5 kilometre to go mark. We flew down a narrow, pot hole ridden descent before we hit a short cobbled section. Still on cobbles we had to make a 90 degree left hand corner before a quick right hand turn onto a road barely wide enough for one car. Then another narrow 90 degree corner and a slight drag upwards to the second last corner of the race. As we navigated the technical lead in to the line the first time all I could think was how crazy the finish would be. Then I started hoping a break would go away to diffuse the chaos. While the race was aggressive and a number of breaks escaped at points (I even found myself in one with Emma Johansson and Thalita de Jong) the right combination never seemed to present itself. Sure, the peloton would splinter on the climbs when Anna van der Breggen would rip everyone else’s legs off as she went for the mountains sprints, but it seemed like nothing was really going away. Coming into the final lap I was with my teammates Ashleigh Moolman and Julie Leth. We made it over the first climb on the circuit comfortably and started making our way closer to the front. Just as we turned onto on of the narrow descents on the circuit our killer guest rider, Demi de Jong (Thalita’s younger sister) launched a fantastic attack putting us in prime position; that being in the lounge chair as our director would say. As we turned onto the final climb of the day Ash and Julie were still perfectly positioned with me. I like having wheels to follow but I also like to surf trains and the girls were doing a fantastic job of just letting me do my thing but making sure they were there to help if I needed them. With three kilometres to go Rabobank were assembling themselves on the front and Julie was in the perfect position tucked on to the back of their train. Riding up to her I said, ‘can you sweep my wheel?’ and she didn’t think twice, immediately she let me slot onto Annemiek’s wheel. We took the sweeping left hand corner onto the descent that resembled more a minefield than a road and braced ourselves for the shock of vibrations. I’ve never ridden a mechanical bull, but I imagine that descent is somewhat similar. Somehow I managed to out manoeuvre Annemiek and slot onto Marianne Vos’ wheel. With 2 kilometres to go I was fourth wheel, tucked nicely onto the Rabobank lead out train. Normally I would have been a bit a nervous about being this far forward with still 2 kilometres to go but with the technical finish I had decided to roll the dice and gamble that too close to the front was better than too far back. But as we made another sweeping left hand corner Vos looked behind her and obviously didn’t like what she saw. She swung out leaving Anna and Lucinda Brand a bike length in front of me. Do I swing with her or do I stay here at the front and hope Lucinda takes me to at least 200metres to go? Letting go of Marianne Vos’ wheel is almost as hard as accepting that Santa isn’t real. If you’re lucky enough to have her wheel, usually you’ll fight tooth and nail to keep it. People talk about life decisions; if you make one decision your life will take one path and if you make another decision it will go on a completely different tangent. That’s what this decision felt like. I chose to stay at the front and with Lucinda. As it turns out, it was the right decision. Anna took the lead until about 800metres to go Lucinda took over. With about 350metres to go there was a technical chicane in the road. Lucinda is one of the best bike handlers in the peloton so as she powered towards it full speed I just kept telling myself, ‘don’t touch the breaks, don’t touch the breaks.’ I couldn’t afford to give her even a metre advantage because I knew she would make the most of it. With 250metres to the go the road tilted up with the gradient hitting about 4 per cent. Still tucked onto Lucinda’s wheel I could feel her speed slowing and I knew I couldn’t wait for much longer, but at the same time 250metres in an uphill sprint is a long way. Waiting. Waiting. I could feel the peloton coming. Just at the right moment I jumped out and grabbed Amy Pieters wheel as she came past. On my right Vos had Thalita tucked onto her wheel. With 150metres to go I saw Thalita launch to the right. I had to go. Drag racing Thalita and Vos for the last 100 metres I could see our wheels nudging in front of each other as we each hit different phases of our pedal strokes. Throwing for the line I knew I had won, but only just. It doesn’t matter, I’ve always been a proponent of the theory ‘it doesn’t matter how much you win by just as long as you win’. I saw my Dad not long after I crossed the line and buried my face in his travel beard which has gotten so out of control he often finds food in it. We were both pretty emotional because we knew this was so much more than just another victory. For me personally, it was a reassurance of why I am doing this and why it’s worth suffering through the hard times. For my parents, they were just happy to see their little girl win. And for teams? Well hopefully it was a sign that I’ve still got it. Youre best years are still to come.. Just crazy that you a team have not signed you yet. Phew! I’m exhausted after reading that. Excitement, tension, drama. It was all there. And what a win – against the best. Fantastic! Here’s to more wins, a brand new you beaut contract and the future!! !